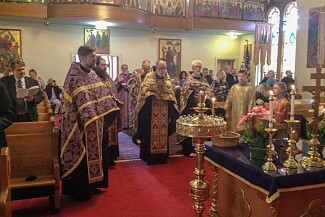 On Sunday, April 7, the Assumption of the Holy Virgin Orthodox Church in Philadelphia, PA hosted the Mission Vesper Service for the Fourth Sunday of Great Lent, Saint John of the Ladder, and was sponsored by both the Philadelphia Deanery of the Diocese and the Philadelphia Pan-Orthodox Clergy Brotherhood. Six priests, two deacons, four altar servers, and 85 faithful from the surrounding Philadelphia region were in attendance on a beautiful, sunny and windy Sunday afternoon. 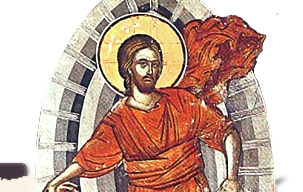 Father Emmanuel Pratsinakis, retired and formally the spiritual leader of Saint Thomas Greek Orthodox Church in Cherry Hill, New Jersey delivered the homily. The Philadelphia area Pan-Orthodox choir sang the Mission Service under the direction of choir director/reader Daniel Drobish. Afterwards, a Lenten meal was served in the church basement by the parishioners of Holy Assumption where one and all gathered and enjoyed their time in Orthodox fellowship.